Chemical Notation – Take advantage of the Chem Box feature that lets you easily use chemical notation. Conic, Equation and Inequality Graphing – Get even more graphing versatility: e.g., access templates for standard formats of conic equations. 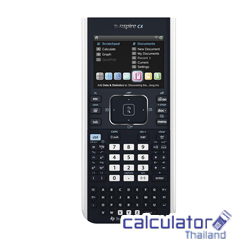 Press-to-Test – designed to quickly prepare the TI-Nspire for high-stakes exams, and easily restores for classroom use after the exam.